While this is a good start, a much wider assessment is needed to strengthen Iraq’s capacity to minimize civilian exposure to toxic remnants of war and their acute and chronic health impacts. And larger questions loom: How can we hold the perpetrators accountable? What are the long-term environmental health risks for affected communities? Could the pollution—and inadequate responses to it—spur political grievances? Over the last three years, little work has been done to assess the environmental damage from the conflict against ISIS. Institutions in affected areas have partly or completely collapsed; crucial data and expertise are missing; and there is little capacity to monitor and respond to pollution. Before the conflict with ISIS, Iraq was setting up a functioning system to monitor pollution and address other environmental issues, such as water scarcity and industrial toxic waste. Iraq was already struggling with toxic remnants from the previous wars that ravaged the country. UNEP identified several environmental hotspots, helped strengthen environmental regulations, and built capacity for clean-up and remediation work. But while money flowed in to rebuild Iraq’s oil industry, the level of attention to environmental issues remained fairly low. Mismanagement and corruption often hindered effective implementation of efforts to tackle toxic waste problems, remediate polluted sites, and improve industrial regulation. After ISIS took over large parts of northern Iraq in 2014, the battle to defeat them quickly rolled back any progress that had been made on environmental recovery. Even worse, ISIS’ scorched earth tactics had a devastating impact on Ninewah and Kirkuk governorates. Dozens of oil wells burned for months, some of them even years, clouding communities under dark smoke plumes that blocked the sun in the apocalyptically named “Daesh Winter.” A sulphur fire and subsequent toxic smoke cloud at the Mishraq factory also directly affected the health of thousands of civilians in surrounding villages. The conflict polluted water sources and left Iraq littered with millions of tons rubble and debris from destroyed cities and towns, as well as toxic waste from industrial sites and artisanal oil refining. Traditionally, conflict-related environmental damage and subsequent health risks for communities receive little attention during post-conflict reconstruction and rehabilitation, where it competes with more pressing humanitarian concerns. This is slowly changing, as we learn how important environmental conditions are for socio-economic development and how the toxic remnants of war affect health and well-being. Civilians can be directly exposed to toxic materials like munition remnants, or to hazardous materials released into the environment when industrial sites are targeted. Over the long term, pollutants from contaminated drinking water or soil can build up in the body, causing long-term health damage, especially to children. If these environmental risks are not properly addressed, the well-meaning efforts to clean up may backfire against the authorities involved in post-conflict reconstruction. Grievances from insufficient remediation of conflict-related pollution in Iraq, South Sudan, and Vietnam have led to protests. Even in the United States, contamination from military bases and firing ranges has raised concerns. The international community will need to provide funding and technical assistance to support identification and clearing of Iraq’s most pressing hotspots. Next, the environmental health of affected communities should be monitored, which will also support taking a more evidence-based approach towards conflict pollution and its consequences for civilians in the future. Such an approach should be mainstreamed in both humanitarian response and post-conflict reconstruction programs at all relevant levels, from identification of direct need to long-term monitoring and rehabilitation work. Of course, this leaves a big financial elephant in the room. Non-state armed groups or terrorists like ISIS are not going to pay. In past conflicts, some countries responsible for pollution have voluntarily provided funds, like the United States did to clean up Agent Orange pollution in Vietnam, or forced to pay, like Iraq following its invasion of Kuwait. Other debates are stalled, such as Lebanon’s complaint asking Israel to pay for clean-up of oil spilled during the 2006 war with Hezbollah. So who will pay for the clean-up of pollution in Iraq? At the UN Environmental Assembly meeting, to be held in Nairobi this December, Iraq will submit a resolution on “Pollution prevention and control in areas affected by terrorist operations and armed conflict.” The draft language outlines various core issues in providing international assistance for countries dealing with environmental damage a result of armed conflict, such as minimizing damage to potentially hazardous facilities and infrastructure in military operations, and ensuring communities affected by pollution caused by conflict get support for remediation and healthcare. The resolution asks that specialist international agencies assist in identifying, monitoring, and cleaning up the toxic remnants of war. While funding these activities will be challenge, efficient and effective policies to address environmental issues in humanitarian response and recovery will provide cost benefits for the international community. Better information on local environmental damage and creation of conflict-related sources of pollution could support a more efficient response to these threats, mitigating long-term impacts on health and the subsequent social-economic costs. This could be done by applying novel tools and technologies to identify and monitor conflicts and the potential environmental hotspots they create. incorporate existing knowledge and expertise from environmental emergencies from relevant organizations including UNEP, NGOs, and the private sector. Countries with a history of dealing with environmental issues could provide funding to kick start to the above-mentioned work and lead by example to demonstrate the direct and long-term benefits of tackling environmental damage cause by conflict. Larger reconstruction efforts through the World Bank should incorporate this issue in programming. This approach could help us paint a picture of the true cost of war that includes the long-term effects of its enormous environmental damage and the acute and chronic health risks to civilians. Ideally, it could also restrain polluting military practices or tactics by putting a price on these operations. If no one is willing to pick up the bill for the environmental costs of war, we should take more steps to avoid running up such a huge tab and adding to the health burden of civilians trying to rebuild their lives and livelihoods after war. Wim Zwijnenburg is the project leader for humanitarian disarmament at PAX, a Netherlands-based NGO focused on promoting peace. 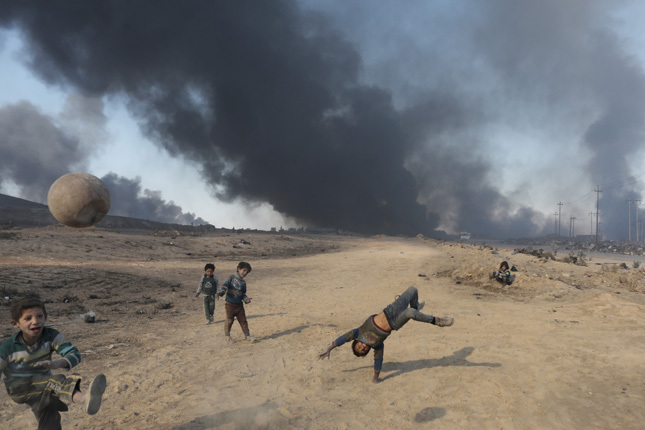 Photo Credit: Boys play with a ball in front of oil fields burned by Islamic State fighters in Qayyarah, south of Mosul, Iraq, November, 2016, courtesy of Flickr user El Gee Cafe.